In het kader van Europan 11 is in samenwerking met Cecilia Gross en René Kuiken een plan gemaakt voor de uitbreiding van de dorpen Lillerød en Blovstrød ten noorden van Kopenhagen. Om de trend te stoppen van het langzaam dichtgroeiende landschap tussen de dorpen, stellen wij als hart van de uitbreiding een park voor. Het park vormt een nieuw sociaal centrum van de uitbreidingswijk en de twee dorpen. Het plan is door de jury opgenomen in de shortlist van 6 beste ontwerpen. Klik hier om het boekje ‘Allerød City Green’ te downloaden. The paradox of the suburb is that, in this quiet safe environment, individuality is ‘physically’ most manifested. Closed gardens, empty streets. The question is how to expand a suburban city in such a way that connectivity on social and physical level is stimulated. A sustainable city, is a city where people are connected, live in harmony with nature and celebrate life. The area between Lillerød and Blovstrød is, considered by The Fingerplan of the capital Copenhagen, one of the last areas to develop. This possible future of this area made it for years an area where every function, which couldn’t find an easy fit in the existing urban fabric, found it’s place. Resulting in a diffuse area, no nature or city, inhabited by sportsvenues, retail, leisure and enormous compounds of commerce. The ugly face of urban sprawl. This will, most certain, be an ongoing process, starting with the wish to create an extra 600 dwellings in this area. To stop this ‘filling up’, it’s of high importance to create an overall vision for the municipality of Allerød. The future character of the ‘in-between’ space should be determined now! 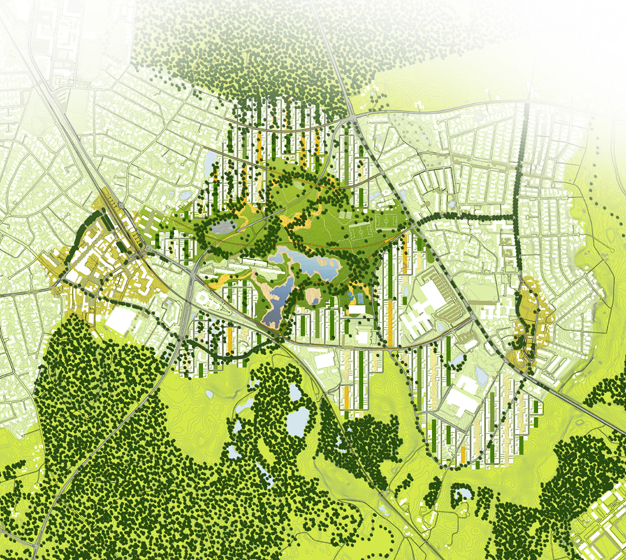 ‘Allerød City Green’ brings this solution in the sense of The Fingerplan. Safeguarding proximity to nature, free-flowing traffic, an attractive urban environment and leisure area as well as a beautiful countryside. The different facilities in the in-between area play on a social level an important role. This is where the inhabitants meet. By concentrating these leisure and sports-facilities, in a central suburban park, a stronger link between the two cities is being made. 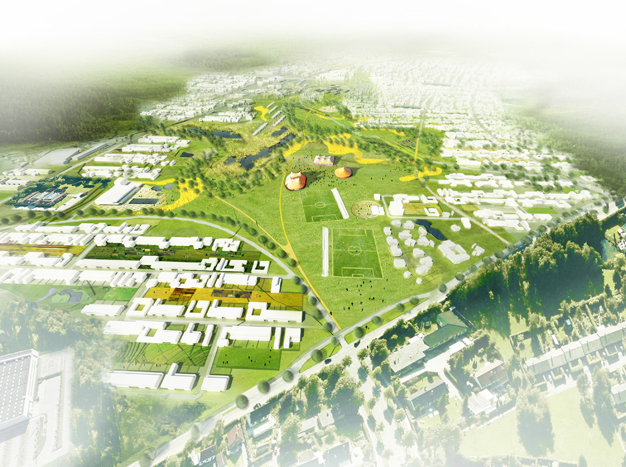 A new modern village green, on the scale of Allerød, is created. This is where the inhabitants, surrounded by an urban fringe, will celebrate Sankt Hans aften, do sports, clean their water and spend there lunchbreak. The new City Green is both center and green space. The typology of the suburb is known for his closeness. Behind high fences, made out of green or wood, lies the private domain. The public street, where nothing is happening, is made out of closed walls. The average suburb plot in Allerød is one third house and two third garden. By dividing the private garden in a private and collective part a new suburb typology is created. The collective area’s in between the houses , the suburban mews, will bring, even on the lowest scale, connectivity. Owned and activated by its surrounded inhabitants a new suburban life is created. The variety of private spaces, back-, front- , in-between gardens, patios and terraces, determine a rich variety of typologies. And the houses have a clear relationship with the street. No more closed green walls but the theatre of the private house on the street. The economical activity of Allerød is to attract more families with children and people of working age. This can, if not master-planned, be a very destructive force. 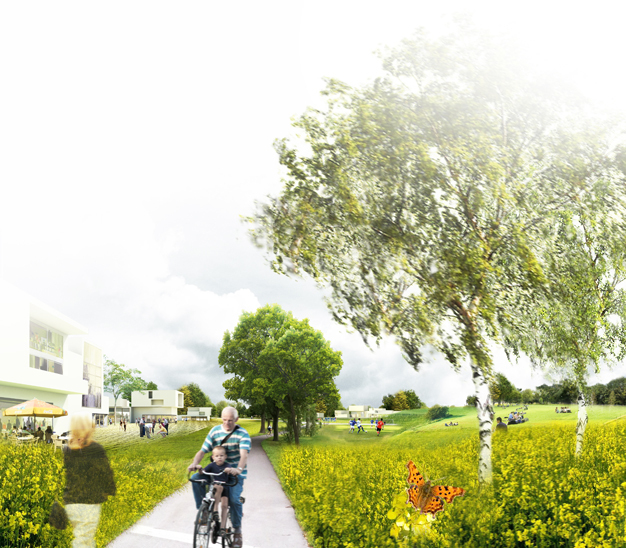 ‘Allerød City Green’ is considering these consequences as the main design issues, and therefore determines, in advance and well connected, places for social and ecological consequences.